Our Easter celebration weekend began with a trip over to the ball field where Cam will be playing baseball in another week! The Easter bunny was there to greet all of the kids and volunteers helped with crafts and finding chocolate eggs. Cooler winds pushed most families out earlier than expected, but there was still time for a little face painting. This professional artist used to work at Universal Studios in Florida- we certainly felt fortunate to be in the midst of such a pro. Cam opted for a baseball to be painted on his cheek. Easter Sunday began with a church service with our favorite neighbors and longtime friends, the Raisch fam. It was such a beautiful morning and Cam loved sitting next to his buddy, Emma. Oma and Opa arrived at their grandson's home just in time for an Easter egg hunt. 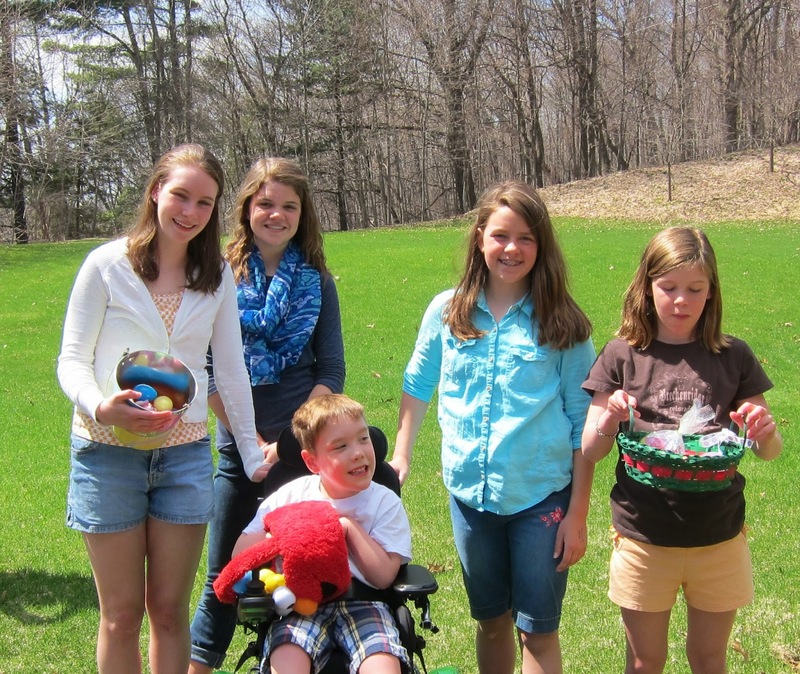 Chris expertly hid plastic eggs (and real ones) filled with goodies all over the yard. The five finders quickly gathered up all of their treats. This was the first holiday dinner celebration that Jane opted for a non-traditional menu. Eating grilled steak and seafood seemed fitting for outdoor dining. Most of the real colored eggs were quickly turned into a tasty appetizer. Mashed potatoes, broccoli and biscuits complemented the meat and fresh fish. Oma and Opa brought a pair of gorgeous daffodils and tulips, which were promptly planted next to the mailbox. At the end of day, we were filled with good food, the love of family and friends, and the renewal of life.